Does anyone have any pointers on how to have the LAN connection listed? Thank you. Might try to run t2 provision with the Tessel plugged in with the usb cable. Then try the t2 list again. @ccabanero What type of network are you connected to? Does it allow for device discovery? Some work or coffee shop networks are setup to block device discovery for security concerns. Thanks @Ryan_Gill I can now see both the LAN & USB connection now after 't2 provision' - thanks for the reminder on that. @HipsterBrown - thanks for the tip re: looking into device discovery. I'm on my home network (Comcast) where I have both a 5G and 2.4 network. I just realized too that I am able to successfully connect to my Tessel 2 over 5G. Is that now supported (or am I going insane)? Hmmm Tessel should only be able to discover and connect to 2.4 GHz frequencies. Do you have a screenshot or quick recording of that happening? I have a Tessel 2 USB connected to my Mac. 1. On macOS Sierra, I use Terminal to issue 't2 list' which is listing both a USB and LAN connection. 2. In my home network (Comcast), I have shire (5G) and shire-2.4. 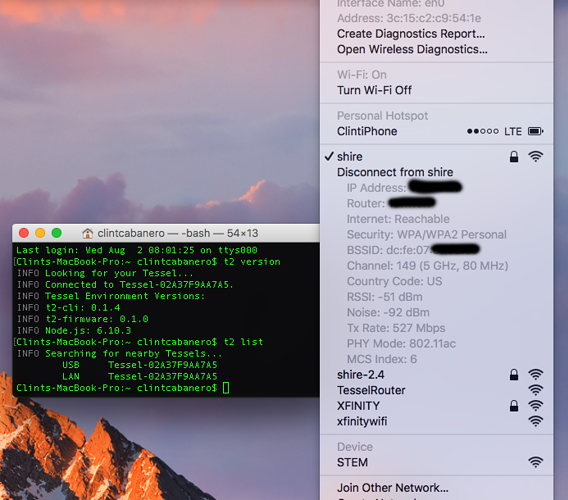 Note, that when I do Option + Airport I see "Channel: 149 (5GHz, 80 MHz)" which I believe confirms that my Mac is connected to Wifi via a 5G network? What does t2 wifi show? I am running into the same problem. When I run t2 wifi -n..... I get response that says that wifi is connected via the network I specified. However, t2 list doesn't show the LAN connection. Any help is appreciated.